Will your paycheck go up by 5 percent or more each year for the next two years? That’s how much your state legislators may raise your taxes. While it’s not over until it’s over, the time to correct the Texas Legislature’s spending excess is quickly running out before sine die. Thankfully, Governor Abbott, Lt. Gov. Patrick, and Speaker Bonnen recently proposed a plan that could provide real cuts to the amount you pay in property taxes to school districts. This swap plan must first include limiting government spending growth in return for a penny increase in the sales tax. That could cut school districts’ property taxes by $5 billion per year, or 7.4-cents per $100 valuation, to put those taxes on a path to elimination so families and businesses can keep their property and stop paying rent to the government. The Texas House’s and Senate’s passed versions of the 2020-21 budget grow government faster than Texans’ ability to pay for them, and they don’t mandate meaningful property tax reform and relief, something Texans desperately need. The House’s version of the budget (House Bill 1) was passed unanimously in the House, then the Senate substituted its language and passed its bill unanimously. This means that the only stop left before making it to the Governor’s desk is the conference committee, where members of the House and Senate will iron out the differences. That means there’s little time left for lawmakers to demonstrate their commitment to the Texas Model of low taxes, reasonable regulation, and more liberty—the very things that have made Texas the economic powerhouse of the nation. Lawmakers should cut spending in the proposed budgets to levels signed off on by 18 groups—led by the Texas Public Policy Foundation—last year when we formed the Conservative Texas Budget Coalition. We define a Conservative Texas Budget as one that doesn’t grow faster than the average Texans’ ability to pay for it, meaning population growth plus inflation. That translates to a two-year total budget of $234.1 billion, which is healthy growth of 8 percent over the last two-year budget. Any increase above that number represents excessive government—bigger, more burdensome, and more involved in our lives. But the House-passed 2020-21 budget exceeds this, at $246.5 billion, excluding $8.3 billion to Harvey recovery and including money from their passed supplemental, a full 14 percent higher than what was initially appropriated last session. Those extra billions of dollars will have to be collected from your pockets. A big part of this excessive budget is in a $9 billion increase dedicated to public education and property tax relief. But more than two-thirds of this goes to public schools, with the rest going to cut school districts’ property tax rates by 4 cents, which for some may mean a temporary reduction in your tax bill. Why temporary? Because unless this relief is tied to property tax reform—like that proposed in House Bill 2 and Senate Bill 2, which would limit how much local taxing entities can raise taxes without voter approval—then rising property values and tax rates will soon gobble up any potential savings. 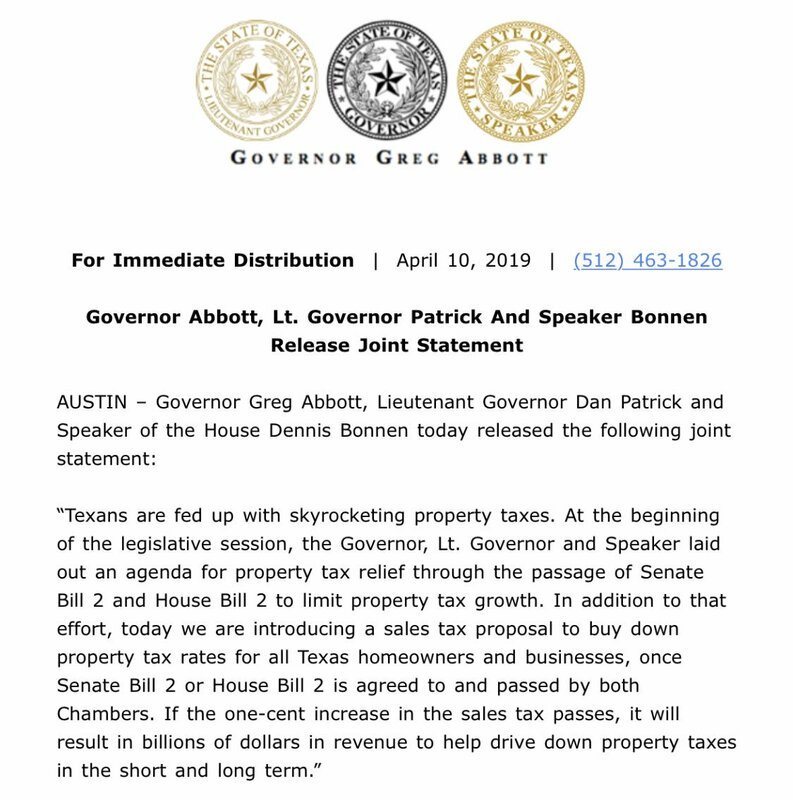 Texans want not only property tax reform of slower growth in property taxes, but also meaningful, permanent property tax relief in the form of reductions. Unfortunately, that’s not in the House budget, though there are bills that could offer it, including bills that would use revenue growth and constraints on spending to buy down and ultimately eliminate the school tax portion of your property tax bill (the biggest portion for us) over time. Lawmakers should listen to their constituents on this—too many Texans are being taxed out of their homes and businesses. Until the Legislature addresses skyrocketing property taxes, we will all be subject to the day when we can’t afford them, making it even more real that we just rent our home from the government. While there was some reason to be hopeful with the Senate’s proposed budget, its budget ultimately exceeded our ability to pay for government and doesn’t include lasting property tax relief. The Senate’s budget at $239.1 billion, excluding Harvey money and including supplemental appropriations, is up 10 percent in total, far above the Conservative Texas Budget limit but closer than the House’s budget. If the $2.7 billion currently allocated to property tax relief and the $2.3 billion potentially for public schools were to all go to relief, they had a chance to provide a substantial $5 billion to tax relief while getting them within reach of this limit. Unfortunately, the Senate didn’t make these key changes to their budget and instead Texans will have to pick-up the tab for a large increase in spending. Again, will your pay go up at least 5 percent per year? Still, there’s some indication that lawmakers are thinking about us, the taxpayers. Rep. Matt Shaheen, R-Plano, successfully added an amendment that requires any funds in the budget allocated to property tax relief be actually used for that purpose. It sounds a little odd to have to specify this, but it does show a commitment on the part of lawmakers to follow through on this pledge. The amendment passed overwhelmingly. It’s also encouraging that Rep. Jeff Leach, R-Allen, succeeded in cutting $15 million from film subsidies and reallocated it to Medicaid for new mothers. Those film subsidies overpromise, under-deliver and only benefit companies that don’t need the corporate welfare. And Sen. Bob Hall, R-Edgewood, made a case for the need of a conservative budget and real property tax relief in the Senate, though there were no amendments to it to achieve those worthy goals. But getting this budget right by the end of session is essential. Considering high taxes are always and everywhere a spending problem, Texas lawmakers have a unique opportunity here to stop runaway taxes and provide real cuts by simply restraining growth in the budget and doing an effective tax swap. But that time is quickly running out. Let’s make sure it happens.